The Wadi Al Beih Dam, built in 1982 in Ras Al Khaimah, was filled with rainwater during the wet weather over the past few days, according to the National Centre for Meteorology (NCM). Wadi Shah, also in Ras Al Khaimah, recorded 247.4 mm of rainwater, breaking the national rainfall record. In 2003, Abu Dhabi’s Al Razeen recorded the highest rainfall at 189.8 mm, said the NCM. From April 9 to 14, Wadi Shah in RAK received the highest recorded rainfall at 247.4 mm, followed by Jebel Jais at 182.3 mm, Mebreh Mountains at 119.5 mm. Falaj Al Mualla received 108.1 mm of rain while Saqr Port witnessed 88.1 mm, according to the agency. 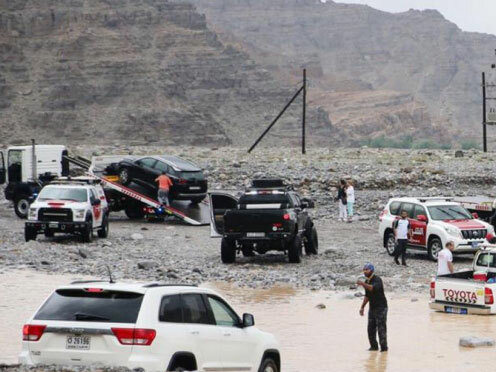 On Monday, the police chief of Ras Al Khaimah announced that the unstable weather has finally come to an end, and pointed out that the storm was one of the strongest to have affected the emirate in a long time. In a statement, Major General Ali Abdullah Bin Alwan Al Nuaimi, commander-in-chief of Ras Al Khaimah Police and Head of the Emergency and Crisis Management Team in the emirate of Ras Al Khaimah, said: “In the last two days, police received 3, 072 complaints from the public.